Believe it or not, the beans in this picture were kept in an upcycled small juice container as an improvised baby toy for the past four years. My kids never thought to open the container! We had some friends we don’t see very often over last month, and they were the ones who figured out that the top came off! Your Johnny is so smart! I am going to do this with Jack, but let’s count on them ending up being used as construction site materials:-)! Either way, he’ll have fun and it’s another super idea from you! .-= Susana´s last blog ..Homemade Crayons for Jack =-. 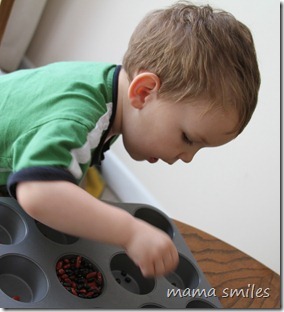 @Susana – I love how your Jack puts everything in his little trucks – super cute! Great idea for sorting! My kids would love the sound and the tactile experience. .-= Jaimie´s last blog ..On the Road Again =-. Guess that makes Johnny an official bean counter? .-= Natalie´s last blog ..Science Sunday – Gravity =-. We’ve had adults accidentally “spill the beans” by offering info they thought was good news to our kids only to find out we were trying to keep it a secret! Like when one of our friends excitedly told our kids they were opening a McDonald’s in a nearby town in S. Africa. Joshua was ecstatic. I was not! At least Johnny is quite occupied by this new discovery! .-= Jen´s last blog ..From The Archives – Strawberry Shortcake =-. lol. love the new use though. .-= Beverly´s last blog ..an angel…my angel =-. I love how you turned the loss of a popular toy into an absorbing activity for Johnny! .-= Elisa | blissfulE´s last blog ..Nikki’s first performance =-. It took half an hour to end up dumping them on the floor. Seriously? .-= Ticia´s last blog ..Math Links- Finding numbers =-. Now I will try to remember to put away the handmade maracas when we host playdates. ;-) lol Too cute! .-= Valerie @ Frugal Family Fun Blog´s last blog ..Tripping the Lights Fantastic =-. @Valerie – Haha honestly I’m shocked it lasted this long!